Virtual Reality is taking over in museums. Natural science and art historical exhibition institutions open up unimagined dimensions with the new technology. Just a few hand movements transport museum visitors into another world. One selects the app on one’s smartphone, the phone is affixed to the casing of the VR headset, the device placed on one’s head and the image focused with a small dial. One proceeds over the massive stone staircase – virtually – into the interior of the building. One goes through the lobby, up another staircase, down a hall – and can now decide whether to discover the museum with a preset tour, a tour of the masterpieces, or perhaps take off on on one’s own instead. 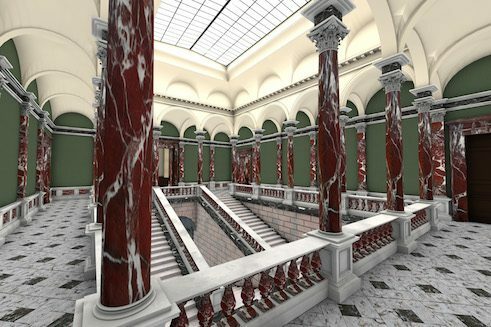 Project Zeitreise | Präsentation of the Städel Collection 1833 | Photo: Städel Museum Virtual Reality, immersion in computer-generated, interactive virtual surroundings, has arrived in Germany’s museums. This is made abundantly clear by Zeitreise (Time Machine), a virtual-reality app by the Städel Museum in Frankfurt. A team around Jochen Sander, deputy director of the renowned institution, developed the app. To use it all one needs is a suitable virtual reality headset by the manufacturer Samsung. The specific feature of the virtual tours enabled by this app is that visitors do not move through an actual 3-D reconstruction of the museum, but make acquaintance with the exhibition spaces as they were in 1878, when the Städel was opened on the banks of the Main in Frankfurt. Project Zeitreise | Städel Museum in 19th century | Photo: Städel Museum While the visitor is seemingly strolling through the old spaces, he thinks he hears the wooden floor creaking. He sees the paintings, which at that time were not hung next to each other on the walls, and learns that a few of the paintings that at the time were presented as masterpieces have in fact been in storage for years. The Zeitreise app illustrates how the assessment of works of art has changed in the course of the years – and also shows that in the 19th century the manner of presenting art was radically different from that of the present. The basis for the Zeitreise app’s VR tours is the result of an extensive research project for which Jochen Sander scrutinised the history of the institution’s collections and exhibitions. In addition to the app, a website has arisen (http://zeitreise.staedelmuseum.de) that also portrays the museum’s predecessors. Before art patron Johann Friedrich Städel had the exhibition facility built on the banks of the River Main, he displayed his extraordinary collection – which his contemporary Johann Wolfgang Goethe raved about – in his private residences. It also offers an abundance of background information from the research project. 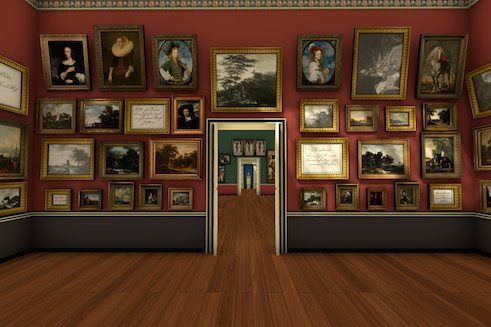 Where the VR app renders the past accessible in a playful manner, the website delves deeper. 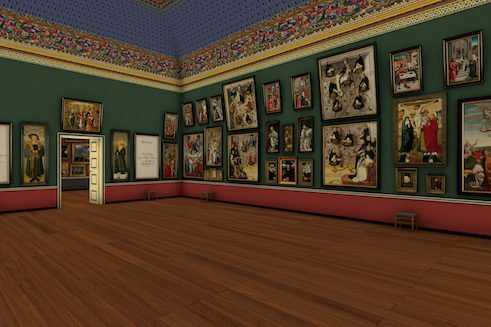 Project Zeitreise | Präsentation of the Städel Collection 1833 | Photo: Städel Museum Frankfurt’s Städel Museum is not the only exhibition house in the German-language cultural area to experiment with virtual-reality technology. 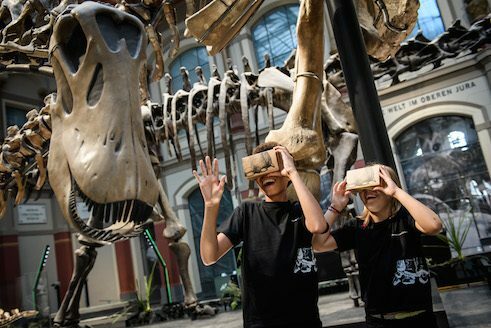 The Senckenberg Naturmuseum at the opposite end of the city has been lending out VR headsets since mid-November, with whose aid one can go on a journey into the past in the dinosaurs’ exhibition space. With a headset like this before one’s eyes, the space is transformed into a landscape with ferns and other vegetation, and the skeleton of a Diplodocus dinosaur suddenly starts moving. 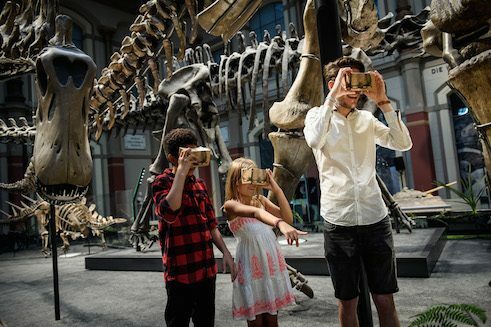 Virtual Reality in Naturkundemuseum Berlin | Photo: Stefan Höderath/Google Arts & Culture And the Museum für Naturkunde in Berlin has also just recently reawakened a dinosaur to life by means of VR technology. The skeleton of a Giraffatitan, more than 13 metres tall, is the highlight of the institution’s hall of dinosaurs. This primeval dino now moves its long neck in 3D animation through the hall, eyes the viewer, and makes loud rumbling sounds. One can experience the virtual Giraffatitan via a Google app or as a 360° video on the online portal YouTube. The list of museums now working with this new technology is long. VR projects have been realised in the Naturhistorisches Museum in Vienna, in the Staatliches Naturhistorisches Museum in Braunschweig, in the Ozeaneum in Stralsund and in the Berliner Stadtmuseum. The Bayerisches Nationalmuseum in Munich is experimenting with augmented reality technology, in which virtual and actual reality are combined. A range of artworks can be viewed with an iPad, with additional information on the exhibits appearing on the screen. In this way, in the case of an individual figure by sculptor Tilman Riemenschneider, the application makes visible the entire altar to which the figure once belonged. Alexander Jürgs is an independent author from Frankfurt. He write for „Die Welt“, „Merian“, „Der Freitag“ and nachtkritik.de. Copyright: Goethe-Institut, Alexander Jürgs. This work is licensed under a Creative Commons Attribution – Share Alike 3.0 Germany license.